The emotion that I felt while reading this book? Wow! It was intense. Granted it was a huge negative emotion in the fact that I thoroughly detested one of the main characters. A man suffering, but the damage he caused, erased any pity you ever had for the man. I read this book seething. I will let you know domestic abuse is in full swing in the book. Not a plus or a negative, just a factor. I was so mesmerized with this book and will remember a dreary winter day, spent in bed under the blankets totally living this Alaskan adventure. 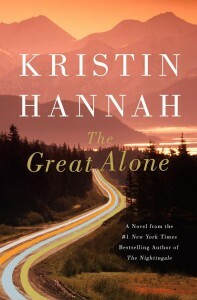 Thanks to St. Martin's Press, Kristin Hannah and Net Galley for providing me a perfect winter day and a free e-galley in exchange for an honest, unbiased review.